- The plot of this episode was originally pitched to an executive producer of VOY by Mike Sussman at about the end of VOY Season 6. 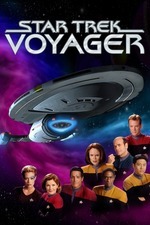 The executive producer bought the pitch, although the episode wasn't made until the seventh season of Star Trek: Voyager. - This episode revisits periods on Voyager from the episodes "Caretaker", "Basics, Part II", "Bliss" (not "Waking Moments" because the lights are dimmed), "Macrocosm", "Scorpion, Part II", and "Bride of Chaotica! ", as well as Stardate 49624 (between the events of "Innocence" and "Tuvix" – The Doctor's time period in sickbay, a year prior to "Future's End") and the year 2394. Chakotay also mentions Janeway's regret about never learning to play an instrument, which she told him in "Remember". - When talking with Chakotay on the bridge, Janeway mentions that her helmsman disappeared while walking down the corridor outside her ready room, likely a reference to Stadi, who was killed when Voyager was pulled into the Delta Quadrant. - This episode is the last appearance of Doctor Chaotica (Martin Rayner) on the series. Robert Duncan McNeill was disappointed that he only appeared three times. "Personally, I would have liked to have done a lot more of Captain Proton," he admitted. "I think the studio and the producers felt like we had done it. We had reached such a pinnacle with it that to go back would be kind of doing it a disservice and undermining the specialness of the 'Bride of Chaotica!' episode in particular. They were hesitant to go back for fear of ruining everyone's memories of it, but I would've loved it." This episode is also the last appearance of Seska (played by Martha Hackett) and the Kazon. - Tuvok's "dying last words" are a variation on Spock's last words to Kirk in Star Trek II: The Wrath of Khan. Alexander Courage's theme from Star Trek can be heard in the background. - Although Seven of Nine's voice was evidently multi-tracked for this installment, the audio effect is missing from her early appearances at the beginning of season four. Janeway intended to serve a pot roast during her dinner with Chakotay, despite the fact that Chakotay had been previously been a vegetarian in VOY: "Unity" and would later be referenced as such by Neelix in VOY: "Workforce". - This was the first original Star Trek episode to air in the 21st century (January 17, 2001). - Because a writing team pitched a virtually identical story to this which had been turned down, they felt they had been mistreated when they saw this installment be broadcast and assumed their story idea had been used, without them having been given credit by Paramount. As a result, the company eventually paid them off. "It's a fascinating story, but as the Ferengi say, a good lie is easier to believe than the truth." "Doesn't sound like Mr. Paris' tastes are very sophisticated." "That's why we love having him around." "Eighth? Everyone knows there are only five dimensions!" "If we restore the timeline, remind me to cancel Mr. Paris' holodeck privileges." "If Seven's idea works, Tuvok and those other crewmen will be fine." "They'll still be stuck in the Delta Quadrant. If the temporal anomaly doesn't kill them something else will – the Borg, telepathic pitcher plants, macroviruses – the Delta Quadrant is a death trap!" "What about the Temporal Prime Directive?" Here, the show really risks wearing out the old "space anomaly brings back familiar faces from seasons ago" gimmick, which they've done at least twice already. But to me, a few factors help keep it from going over that cliff*. One, its breakneck pace; two, they clearly wanted to give a little nostalgic reward to those of us who've stuck with the show through the last six and a half seasons (a bit like those movies where they show stills from earlier scenes during the closing credits, which BTW IMO assumes so much good faith from the audience that you've really got to have earned it, like The Voyage Home did, or else it's distasteful); and three, it's the very rare episode that's both Chakotay-centered and fun. In fact, apart from "Distant Origin," it may well be the only one. Now, speaking of coasting on goodwill: the anomaly in use here is so implausible that I have my doubts it would have ever made it out of the TNG writers room. (Yes, "Timescape" was slightly similar, but it presented the anomaly in a serious and Trek-plausible manner.) But since it's season seven, do any but the most pedantic Trek nerds really care? I feel like no. And did the writers know that? I feel like yes. * = "Help me, Tuvoook!" Yeah, that one counts as a "space anomaly brings back familiar faces from seasons ago" episode, so with "Relativity" and "Fury," that's three. If grown-up Naomi looks naggingly familiar to you, as she did to me, it's either because she was the Orbit gum lady or because she was apparently a recurring character in the Pirates of the Caribbean movies. Particle of the Week: Chronitons, of course. Pointless STO Comparison of the Week: Time travel is a staple of the MMO, although no specific story involves time being fractured in a Shattered or Timescape fashion. * Crew: 137, and an interesting reference to beginning the series with 153, rather than the '150' that is forever referenced when someone on the show discusses the crew count. * This is silly, but it worked for me. But since it's season seven, do any but the most pedantic Trek nerds really care? I feel like no. And did the writers know that? I feel like yes. Yeah, this feels accurate to me as well. On the one hand, this is silly enough to verge on fanfic territory: Macroviruses! Borg vs. Kazon! Janeway straight up asked Chakotay if they were a couple! I also appreciated Seska trying to Seska everything up one last time. Man, they got rid of her too soon. Oh, and it was funny to see them have another go at pretending the Maquis stuff ever mattered - that's been a real S7 theme, so I guess Kenneth Biller was disappointed in how that went too. This was the most important factor when I was watching. A lot of dumb stuff happens during this story, but it keeps doing interesting things constantly, so I was willing to let all of that slide. This is a phenomenon I've discussed here at length before: the best way to get the willing suspension of disbelief from an audience is, IMO, to just do something fun. The more entertained an audience is, the more willing they are to cut a story some slack. it's the very rare episode that's both Chakotay-centered and fun. In fact, apart from "Distant Origin," it may well be the only one. * A little foreshadowing for Endgame here, maybe? Might just be me, but Janeway's attitude toward the Temporal Prime Directive felt a little more lax than usual here. Anyway. This is the first one in awhile that I've just liked, rather than wanting to offer significant notes on, so that was good. This is the first one in awhile that I've just liked, rather than wanting to offer significant notes on, so that was good. Much the same. I got distracted with seeing if there was something on TVTropes where a team is temporarily composed of past and future versions of themselves (the comics' Avengers Forever did it, but I can't think of anyone else who has), but it's kind of a moot point. It does have some resemblance to past time-travel episodes, and to a clip show, but I think the real point is that it also does something that I think that I've commented on before, that we started to see more often starting near the end of S6: the show metacommenting on itself. In this case, it uses the time-travel gimmick to look at itself in different stages (including a possible future stage) to point out, contrary to the most common criticism of the show, that it hasn't always hit the reset button. Having the Cross-Time Crew all storm Engineering at once was pretty awesome, and I liked seeing Future Icheb and Naomi. (I thought that F-Icheb was familiar, but the actor wasn't anyone I'd seen before; he just has a vaguely familar look.) I almost groaned when I saw what they were doing with Tuvok, but he committed to it and made it work. And we got Seska back (yeah!). I feel like maybe, with this and "Worst Case Scenario" (another flashback episode, sort of), Martha Hackett was one of those people that they got rid of too soon (see also Denise Crosby, with Tasha Yar/Sela; also, Jeffrey Combs made such an impression in DS9's "To the Death" that the showrunners retconned the Vorta being cloned in order to bring him back, said explanation ending up being incorporated into the show's plots, including one of their best episodes ever). I also liked Full Borg Seven's nonchalance at aiding them; it was like, resistance is futile, so we'll end up assimilating them anyway, so why the hell not? (I wonder if she had second thoughts after seeing F-Icheb.) There's also a passing reference to Stadi. The only problem I had with the episode, and it's slight, is that I didn't think that Full Bun Janeway would have asked Chakotay if there had ever been anything between them. She may have processed through some of the implications of her being away from her fiance for several years, but I just don't think that she would have made that leap that fast, even speculatively. (Remember that, in "Resolutions", they're together on the Steamy Bathtub Planet for three months before they get close to hooking up.) The Janeway/Chakotay shippers are still around (at least on Tumblr), and maybe the episode could have worked in some other reference to it, but they could have done something else with that parting conversation, I think. If you think about it too hard, it makes no sense. I mean, try to nitpick your way through this one and your head would probably explode. Characters out of character. Waaaay out of character. Time travel and physics that really make no sense whatsoever. The Kazon. Did we really need to see the Kazon again? And yet.... I liked it. A lot. A fun Chakotay show. I think the real point is that it also does something that I think that I've commented on before, that we started to see more often starting near the end of S6: the show metacommenting on itself. I value this even more because to me, it shows enthusiasm for the show itself. Like... the craziness in this episode is plainly affectionate. The people behind this watch and like Voyager itself, and that's infectious. I also liked Full Borg Seven's nonchalance at aiding them; it was like, resistance is futile, so we'll end up assimilating them anyway, so why the hell not? Right? I loved her little Borg Powerpoint about it too, even though it was a serious case of WTF. The Janeway/Chakotay shippers are still around (at least on Tumblr), and maybe the episode could have worked in some other reference to it, but they could have done something else with that parting conversation, I think. That was definitely the most fanfic-ish moment in an episode laden with it, yeah. And yet.... I liked it. A lot. Yeah. I think this gets back to: since Voyager was never going to do grimndark very well, they should've embraced the crazy more often.